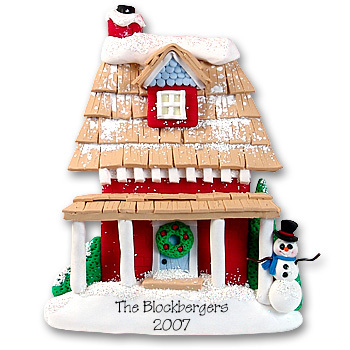 Our Victorian style farmhouse is the perfect personalized gift for any family. It is very detailed with shingles, corbels and decorative trim. It has a very "homey" feel to it with a snowman in the yard and sprinkled with snow and glitter for just the right amount of sparkle. It comes complete with hooks and a satin ribbon for hanging. It is handmade from polymer clay and easily personalized with a family name and year.